Luton Town boss Nathan Jones is in the running to win his third Sky Bet League Two Manager of the Month award this season. 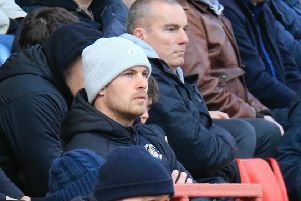 The Hatters chief, who received the honour in October and November, has been nominated for April's prize along with Accrington's John Coleman, Wycombe's Gareth Ainsworth and Grimsby's Michaely Jolley after leading Luton to victories over Mansfield, Yeovil, Crewe and Forest Green, with a 1-1 draw at Carlisle, sealing promotion to League One as well. On why Jones was nominated, sponsors of the league Sky Bet said: "Reaped his reward for continuing to encourage his attacking side to express themselves as they collected 13 points from five unbeaten games and sealed the automatic promotion place they have occupied since the autumn." The winner will be announced on Friday, while the player of the month will go to one of Alex Revell (Stevenage), Mitch Rose (Grimsby Town), Jayden Stockley (Exeter City) and Dan Sweeney (Barnet).